Rosemary (Rosmarinus officinalis) can resist many pest and disease problems, but plants weakened or stressed may fall prey to problems. The shrub grows in U.S. Department of Agriculture plant hardiness zones 8 through 10, but it also thrives as a potted plant in any climate. Soil or site conditions are common problems, although pests and fungus can also kill rosemary. It can be difficult or even impossible to save rosemary once it begins to die, but quick diagnosis and treatment sometimes prove successful. 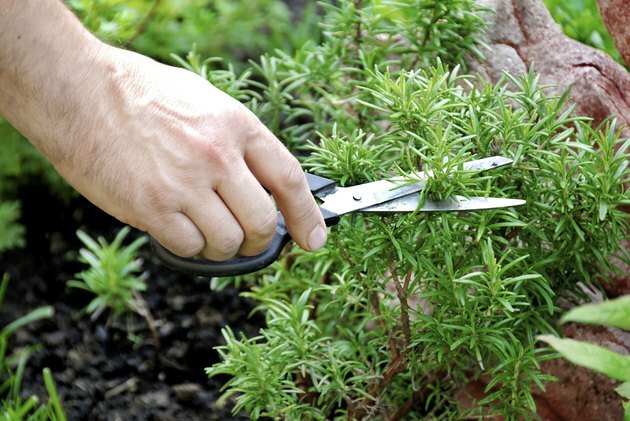 A gardner trims a small rosemary bush. Winter freezes can kill a rosemary shrub, but it may not become obvious until after the temperature begins to warm in spring. The evergreen sprigs begin losing their color, become dry and brittle, and eventually turn completely brown or yellow. (ref 3) Minor freeze damage only kills a few branches, allowing you to save the plant, while major damage kills the roots and plant entirely. Cut back the damaged branches to the nearest healthy wood using pruning shears disinfected with isopropyl alcohol. The healthy roots and remaining living branches will usually survive and put on new growth through spring and summer. Prevent future stress by growing the rosemary in a pot and overwintering it indoors, or by covering it with a frost blanket when short hard freezes are expected. Locations that easily become wet or waterlogged slowly kill rosemary plants. Rosemary can tolerate more moisture in summer, but wet winter soil quickly kills the plant either by suffocating the roots or by freezing solid. Rosemary prefers well-drained soil and moderate moisture conditions. Dig up and transplant the shrub to a well-drained, full sun garden bed, or transplant it into a pot with bottom drainage holes. Water rosemary about once a week when there is no rainfall and when the top 1 to 2 inches of soil feels dry, providing no more than 1 inch of water at each irrigation. Fungal issues typically go hand-in-hand with wet soil. Root and crown rot, caused by the Phytophthora spp. fungus, cause stunted growth or branch death. The rosemary sprigs yellow and dry out, while the base of the stem and roots become soft, mushy and produce a foul odor. Moving the rosemary to a site with better drainage and refraining from watering until after recovery may allow it to live if the roots aren't badly damaged, but most shrubs won't recover from root rot. Powdery mildew fungus, which forms as a white powder on the rosemary needles, favors dry conditions and warm temperatures between 60 and 80 degree Fahrenheit. Providing the rosemary with full, all-day sunlight and spraying the foliage with water early in the day to rinse away spores can minimize mildew issues. For extreme infections, cut out the mildewed branches with disinfected shears so the remaining healthy branches can recover. Various pests feed on rosemary plants, including spittle bugs, aphids and whiteflies. Rosemary usually recovers from pest damage unless the infestation is severe or if the plant is already weakened by cold or water stress. Pear-shaped aphids feed on the underside of the stems. Spittle bugs leave behind a white, foamy residue that resembles spittle. Treat both by rinsing them off the rosemary with a sharp spray of water, or drench the plant with a ready-to-use insecticidal soap at five-day intervals until the pests are gone. Water sprays and soap products can also help control whiteflies. Spray the plants several times a day with water to discourage the flies and their larvae. Yellow sticky traps or reflective mulch spread around the rosemary may also minimize whitefly problems. Premature needle death, yellowing of the needle tips or a general burned appearance may indicate chemical damage from herbicides, pesticides or improper fertilization. Herbicide drift, which occurs when the wind carries the spray beyond its intended target, causes leaf dieback or kills the entire plant. Pruning out the affected branches may allow the plant to recover if the chemicals haven't reached the roots. Excessive use of fertilizers can lead to the buildup of fertilizer salts in the soil, especially in container-grown plants. Watering the rosemary deeply so the excess moisture drains freely from the bottom of the pot at least once monthly during the summer helps flush out any excess salt. Fertilizer is seldom necessary for a rosemary shrub, especially those grown in garden beds where the trace nutrients in the soil provide sufficient fertilization. Potted plants or those grown in exceptionally poor soil may be suffering from a nutrient deficiency if the plant grows slowly or develops stunted, pale yellow needles. An application of a general purpose fertilizer in early spring should provide enough nutrients to help the plant recover. Follow package instructions or mix 1/2 teaspoon of a soluble 24-8-16 blend with 1 gallon of water, and water the rosemary with the solution. Avoid applying fertilizer directly to the foliage because it can damage the needles.